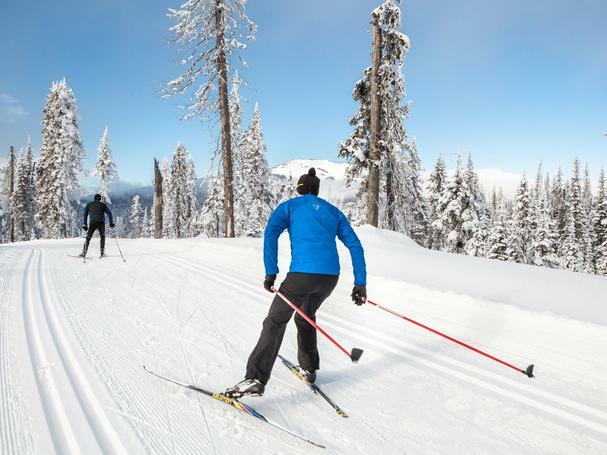 The Winter Okanagan Wine Festival hosted by Sun Peaks Resort, features the rich wines of British Columbia along with some amazing culinary delights. All of this paired well with the champaign snow that one finds in the eastern parts of British Columbia. We left Seattle in somewhat of a downpour, 2 inches of rain for the day, and many mountain areas in the Washington Cascades had 6 inches of rain not snow at 6000’. What a mess!! Glad we went to the famous rain shadow and powder snow capitol of British Columbia. Interesting that you drive (from Seattle) just under 325 miles (6-hour drive time weather dependent; less from Vancouver, BC) to the northeast and to find 5 inches of new snow and a 30 F degree temperature waiting for us at Sun Peaks. Weather 101 tells us that many winter storms come in from the southwest and the heaviest snow (and rain) occurs on the Coastal Mountains of British Columbia and into the Washington Cascades. However, Sun Peaks gets much less snow (a little less than half) and rarely winter rain. The best part is 236 inches (winter total) of champagne powder versus what we call Cascades concrete. Oh let us not forget all the over 2000 hours of sunshine during the year. If you look at the annual percent of possible sunshine, the desert of Arizona is the winner with a total of 90%, with Sun Peaks coming really close at 80%. Seattle and Vancouver get only about 43%. Thus, Sun Peaks name is scientifically validated. Now it was time to enjoy the sun and powder snow at the Nordic Center. There are over 21 miles of groomed trails of which 30% are green (flat) and nicely groomed. Prefect for beginner skiers like us! The good news: even if we did fall into the powdery snow it would have been fun. And – in the three hours of skiing we did not fall! 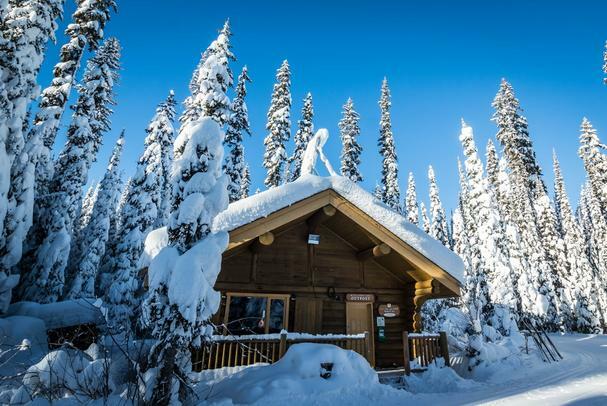 There are so many other Nordic options to explore: the 2.7 miles to McGillivray Lake warming hut, snowshoeing, backcountry skiing and trails for your dog. However, there was not time for more outdoor fun since we were meeting some local dignitaries and the former Olympic Gold Medal downhill skier at the wine festival. Thus, we hopped on the shuttle bus and two minutes later were dropped off at the Sun Peaks Grand Hotel and Conference Center. This was to be our cozy home in the village and the host of the wine festival. We met the Senator for British Columbia, Nancy Greene Raine and the mayor of Sun Peaks, Nancy’s husband Al Raine. Nancy’s past is almost as exciting as her current activities. She won the gold medal in the giant slalom at the 1968 Olympics along with many World Cup victories and several World Cup titles. After all these victories, she retired at the young age of 24 and has not slowed down since. Nancy and her husband were involved in the early stages of development at Whistler (just north of Vancouver, BC) and in on the ground floor of Sun Peaks Resort. Nancy’s current title is Director of Skiing at Sun Peaks and this requires her to spend a lot time on the slopes. My wife and I were invited to join Nancy for some downhill skiing. However we did notice that Nancy’s nickname in skiing is “tiger” so we just stayed with Nordic skiing. 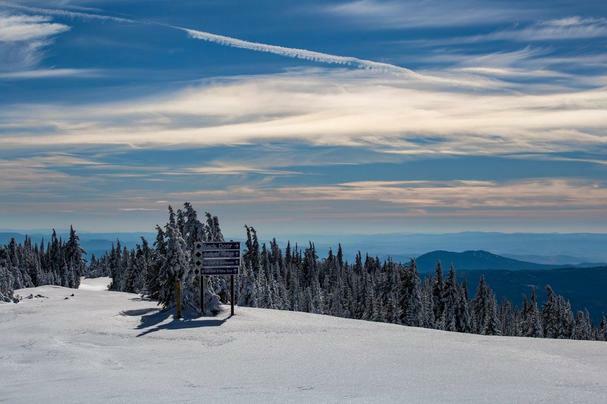 However Sun Peaks offers 4270 acres of skiing and over 2894 feet (882 meters) of vertical. 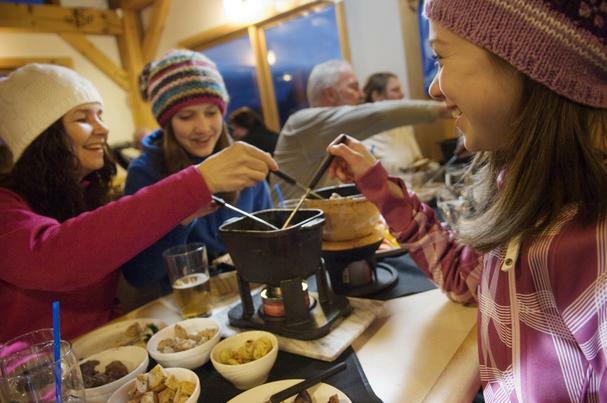 As part of the festival, Nancy led a group on the quad chairlift to enjoy some fondue along a warm fire and afterwards they had a mellow headlamp ski down. 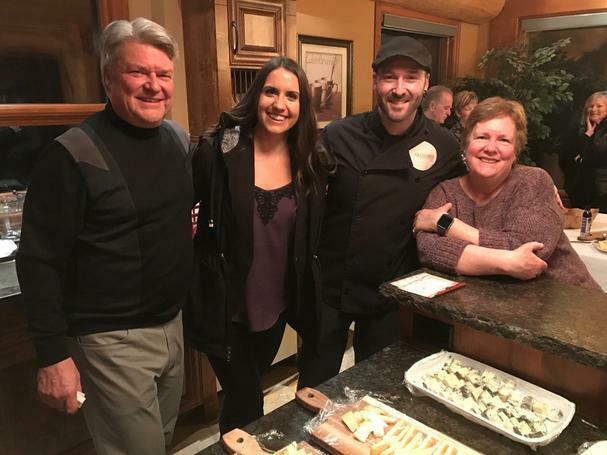 However my wife and I were looking for a more laid back evening at “The Three Elements.” This event was hosted in a stunning private home with samplings of Port style wines, Canadian cheese, and chocolates. Several of the ports were brought by Ingo Grady, Director of Wine Education with Mission Hill Family Estate. He shared his passion and knowledge of the ports we sampled. One can easily say that wine is in his veins since he was raised near Germany’s Moselle River, which is considered one of the most prestigious wine regions in Germany. Ingo came to the Okanagan area as a teen and has been working in the wine business since the 1980s’. Yes, he knows his wine! We first enjoyed the Platinum M. Port from Cedar Creek Winery (owned by principals’ of Mission Hill). This Madeira style of fortified wine was a great start. The other popular styles are Port, Sherry and Marsala. Madeira is named after a volcanic island off the coast of Morocco. Back in the 1400’s, when Madeira was the “port of call” for ships headed to the East Indies, many of the ships carrying wine added grape spirits to keep the wine from spoiling. And, these trips were indeed long and hot, so this wine got “cooked”. The good news is folks really enjoyed the nice kick from this wine, and thus a new wine product - Port - was discovered. Today the wine is placed in steel vats to be cooked. Here is more information on the different styles of fortified wines. Time for the pairing! The Platinum had a soft chocolate nose and paired really well with the Le Bleu D‘Elizabeth Fromagerie from Quebec and, let us not forget, the Onxy Chocolate (72% coco). Nice start to the evening! Next we enjoyed the Liqueur Muscat from La Frenz Winery. This is done in the Australian style. The nose on this is very smooth and with light sweet hints of cinnamon and paired well with the Castello Gorgonzola cheese from Arla Foods. Also not be forgotten is my favorite chocolate, Orange Peel Dark Chocolate. The evening went on for several hours as we had a total of 6 different fortified wines, each with cheeses and chocolates. We were also fortunate to have Dave Beaudoin cheese expert and owner of Squeaky Cheese and consultant for Dairy Farmers of Canada. Being a French Canadian and growing up in Quebec City does give Dave some bragging rights as a cheese expert. You can tell cheese is his love between the workshops he does, and the excellent cheese making. 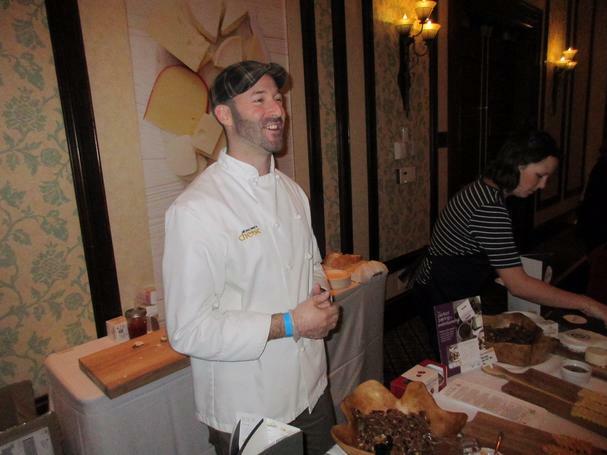 In fact, David is held in such high esteem he is one of the judges for the yearly Canadian Cheese Grand Prix. This fun evening ended and we felt fortified and happy to have the bus driver take us back to the village to recharge ourselves for the next day. The next day started with a stroll downstairs for breakfast at Mantles Restaurant. We dined with the mastermind of all of the Okanagan Wine Festivals, Blair Baldwin. Before we chatted we made a quick trip to the buffet table to enjoy fresh lox and bagels and a custom omelet. The very first wine event goes back to 1980 and was called “Septober Fest” (also seen spelled at Septoberfest) which was a modest, one day event. Blair has now expanded the program to ten days each for the fall, spring, and winter festivals and a shorter one for the summer. You can check out upcoming events here. Since Blair was headed out to organize events for later in the day we debated what to do with our free time. We could do more Nordic skiing or try snowshoeing. 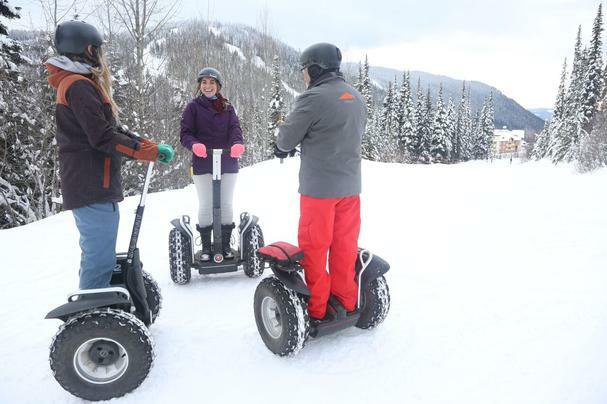 Here are many other choices: Segway through the snow, ice fishing, or dog sled tours. Very difficult choice to make. We considered all of the above options but jumped at the opportunity on this sunny day to check out the village. The mission was to scout out where to have lunch for later in the day and to have a sneak preview of the restaurants that were hosting tonight’s event: “Taste of Sun Peaks”. The first place the Hearthstone Lodge and Bella Italia. 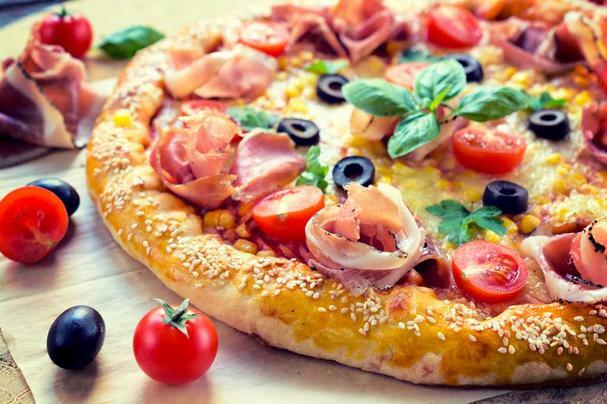 This is a Mediterranean Italian restaurant with pizza and, of course, many pasta options. We are hoping to sample their lasagna with Bolognese sauce or ravioli. Also located in the lodge is Tod Mountain Coffee. Speaking about Tod Mountain that was the name of this ski area before it was changed to Sun Peaks in 1993. Tod Mountain, which is the highest mountain at the ski resort. 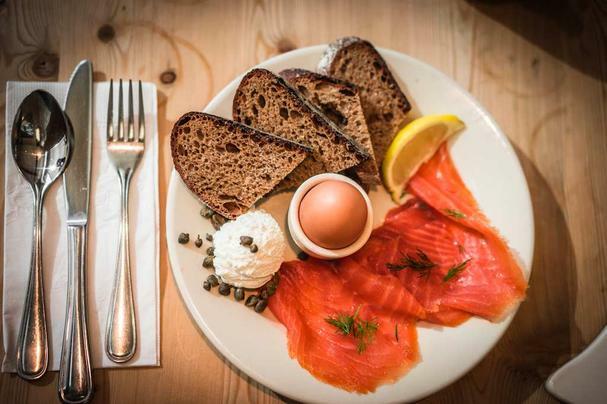 The smells of fresh coffee and crepes sure moved this to the top of our list for lunch today! We continued our search for lunch and went to Cahilty Creek Bar & Grill which our next stop. They were cooking their famous Cahilty Burger described “House Recipe Patty-Red Onion Jay-Applewood Smoked Cheddar.” Hunger was starting to set in but the samples were not quite ready. We knew that would be the first thing we would sample later that night. Next stop was at Morrisey’s Public House and they were also preparing food for tonight. We did notice some live music to check out later, along many craft beers. The local beer was Red Collar Brewing, from Kamloops. They had an IPA for my wife later and Marzen (lager) for me. Both excellent beers! Our last place to check was the first place that we started out that morning, Mantles Restaurant. This decision was easy as the aroma of pizza cooking answered where we would eat lunch. So Margarita Pizza along with the Tomato and Red Pepper Basque was a hit. We retired upstairs to our room to review the wineries that will be at tonight’s event. There were ten wineries being represented. There are over 700 licensed wineries in Canada, with just over 277 licensed wineries (over 929 vineyards) in British Columbia. Over 84% of the vineyards in British Columbia are in the Okanagan. Why is Okanagan so popular? Easy - location! We mentioned all the sun that the wine grapes get to absorb in the summer and combine that with the extra daylight. Growing areas like Kelowna get close to an hour a day more daylight than Napa during the summer. Thus, being further north has its advantages. Road located between Oliver and Osoyoos, which is on the US border. This Cab gets plenty of heat units in the growing season. By way of comparison, Oliver’s average high in July is 86 F while St. Helena (North part of Napa Valley) has a high of 89 F.
We are only discussing our two favorite foods at the event, which I might add was a difficult choice. The other favorite was the tasty Cahilty Burger from Cahilty Creek Bar & Grill. This paired well with the Meritage of Fort Berens Estate Winery. The Meritage is blended with Merlot, Cabernet Franc, and Cabernet Sauvignon. The rich fruity and light pepper notes made this wine the perfect complement to the grilled burger. Fort Berens is unique given the great quality of their reds and how far north they are, just under 160 miles north of Vancouver and at 50.6 degrees north. Past wisdom is that wine is best grown in the 30 to 50 degree latitude range, but that is changing given some of the warming trends of late. Fort Berens is located in Lillooet with an average July 83 F. Just slightly cooler than Napa. We checked out seven more food delights from Sun Peaks and eight more wineries from the Okanagan. Delightful evening and we were done with our gourmet grazing so we started to plan the next day and realized we needed to pace ourselves! After a restful sleep we needed to start packing, since this was sadly our final day at Sun Peaks. However we enjoyed one last coffee and the views of the village from our room. However, before we left, we had a couple more experiences, the first of which can only be described as decadent: The Rocky Mountain Chocolate & Okanagan Wine. To get us through the pairings and lend his expert analysis was Joe Luckhurst of Road 13 Vineyards. Road 13 is located in Oliver and is owned by Joe’s parents, Pam and Mick. Mick was born in Port Alberni and being a logging town, it was easy for Mick work as a logger and in lumberyards. Mick and Pam took over the winery in 2003 and have been working the land. This was an established vineyard, with the first vines planted in the 1960’s. Joe paired six different wines from the Okanagan with Rocky Mountain chocolate, provided and showcased by Owner Lucy Guido. One of our favorite pairings was Moon Cruiser Vineyards. The Syrah paired perfectly with dark chocolate covered with black pepper and almond. The tastes of each, really set the other in perfect balance. Another favorite was the Fifth Element from Joe’s vineyard, Road 13, which paired delightfully with Chili Infused Dark Chocolate. The grapes are from five different vineyards and the wine is done in the bordereau blend tradition. The dark ruby color and a nose of blackberry and black currant went well with the lightly spiced chocolate. 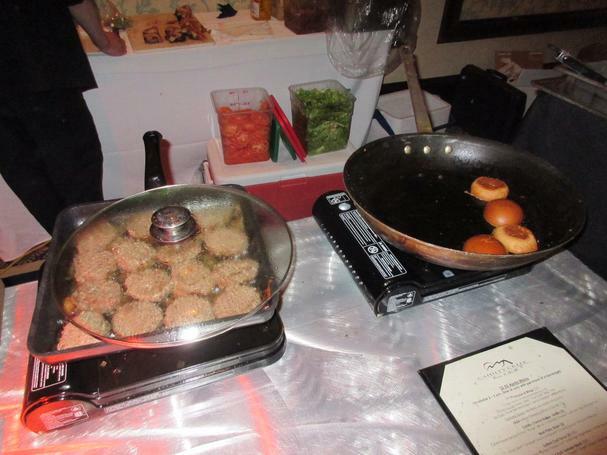 The last event we attended was a fun and tasty surprise: Cider House Rules at 5Forty Café. It probably should not have been a surprise given the history of the area with apple orchards going back to 1910, perhaps earlier. We first sampled the Rider Cider. We enjoyed so much we went back for many samples! My wife and I went back for three samples of the Valencia Orange, really enjoying the refreshing hint of lemons and orange. Also enjoyed was the gentle kick from the 5% alcohol. The crisp and dry Traditional Dry Apple was also good and not overly tart. We also enjoyed Okanagan Premium Cider produced in the just north of here with locally sourced apples. The orange peach was my favorite and I enjoyed the smooth flavor of the light fruits. However the black cherry was a close second. I really liked rich nose with light cherry taste. The 5Forty Café & Grill also provided a smorgasbord of great wraps and panini sandwiches to go along with the ciders. We could have sampled more sandwiches and more ciders but it was time for us to prepare for our journey home. Many thoughts raced around. Should do one last ski run or snowshoe or just be lazy and go on the Segway tour. 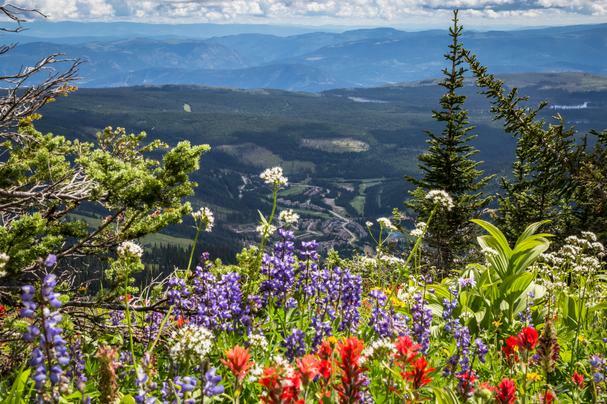 Then our thoughts quickly turned to coming back here in the summer and take the quad ski lift up to the top of the mountains to do some hiking among the wildflowers. Our only regret was that we couldn't stay for the entire ten days of the event, but it was certainly an enjoyable three days of sun, snow, food, wine, and fun. Definitely on our list of places and events worth a return visit! Written by Michael Fagin, Edited by Elizabeth Fagin.